1841 ~ 1860: born in Ôsaka. He started his career at the age of nine, performing in a children-actors troupe under the name of Nakamura Ushinosuke. Later on, he became disciple of Nakamura Baika II, who gave him the name of Nakamura Umenosuke. 3rd lunar month of 1860: tour in Hiroshima; Umenosuke played the role of Iori in the drama "Tengajaya-mura", which was staged within the precincts of the Miyajima shrine. 4th lunar month of 1871: Umenosuke became disciple of the actor Arashi Rikan IV and took the name of Arashi Kitsusaburô IV at the Chikugo no Shibai, playing 3 roles in the drama "Katakiuchi Midô Mae". April 1877: Kitsusaburô played at the Shinmoriza (Nagoya) the roles of Abe no Yasuna and Yakanpei in the drama "Ashiya Dôman Ôuchi Kagami". December 1878: Kitsusaburô played at the Kitagawa no Shibai the role of Otoku in the drama "Domo Mata". November 1880: Kitsusaburô played at the Kitagawa no Shibai the role of Jihizô in the drama "Honchô Nijûshikô"; the role of Yokozô was played by Onoe Tamizô II. October 1881: premiere at the Ebisuza of Katsu Genzô III's drama "Ogasawara Shorei no Oku no Te"; Kitsusaburô played the roles of Odai-no-Kata and Koheiji [casting]. February 1882: Kitsusaburô played at the Tachibanaza (Nagoya) the role of Wakaba-no-Naishi in the classic "Yoshitsune Senbon Zakura". May 1883: Kitsusaburô played at the Ebisuza (Ôsaka) the role of Chidori in the drama "Heike Hyogogashima"; the roles of Shunkan, Tanzaemon, Naritsune and Senoo Tarô were played by Jitsukawa Enjaku I, Jitsukawa Enzaburô III, Arashi Rishô II and Ichikawa Aragorô III. 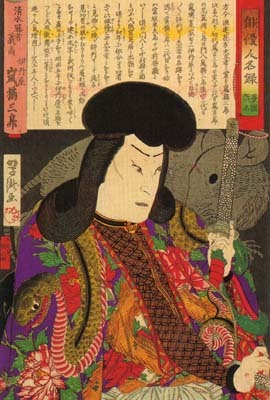 October 1884: Kitsusaburô played at the Ebisuza (Ôsaka) the role of Iori in the drama "Tengajaya-mura"; his stage partners were Arashi Rikan IV (Motoemon), Nakamura Ganjirô I (Genjirô), Jitsukawa Enjaku I (Yasuke, Kôemon) and Ichikawa Aragorô III (Tôma Saburôemon). July 1888: Kitsusaburô played at the Sakaiza (Kyôto) the role of Motoemon in the drama "Tengajaya-mura"; his stage partners were Bandô Jusaburô II (Iori), Nakamura Fukuen (Genjirô) and Ichikawa Aratarô I (Tôma Saburôemon). August 1890: Kitsusaburô played at the Minamigawa Gekijô the role of Danshichi Kurobê in the drama "Natsu Matsuri Naniwa Kagami". October 1890: Kitsusaburô played at the Sakaiza (Kyôto) the role of Abe no Munetô in the drama "Sodehagi Saimon", sharing the stage with Nakamura Jakuemon II and Nakamura Tokizô I.
December 1890: Kitsusaburô played at the Asahiza (Ôsaka) the role of Matahei in the drama "Domo Mata". 31 May 1894: his master Arashi Rikan IV died. January 1895: Kitsusaburô played at the Kado Gekijô the role of Otoku in the drama "Domo Mata"; the role of Matahei was played by Kataoka Gatô III. March 1896: Kitsusaburô played at the Bentenza (Ôsaka) the role of Iwafuji in the drama "Kagamiyama"; his stage partners were Arashi Rikaku IV (Onoe) and Arashi Sangorô VI (Ohatsu). June 1896: Kitsusaburô played at the Bentenza (Ôsaka) the role of Osato in the "Sushiya" scene of the classic "Yoshitsune Senbon Zakura". July ~ August 1896: Kitsusaburô played at the Kado Gekijô the role of Issun Tokubê in the drama "Natsu Matsuri Naniwa Kagami". October 1896: Kitsusaburô played at the Bentenza (Ôsaka) the role of Tamate Gozen in the drama "Sesshû Gappô-ga-Tsuji"; his stage partners were Ichikawa Aratarô I (Gappô) and Onoe Tamimaru II (Shuntokumaru). June 1897: Kitsusaburô played at the Bentenza the role of Osato in the classic "Yoshitsune Senbon Zakura". May 1900: Kitsusaburô played at the Misonoza (Nagoya) the role of Shigenoi in the drama "Koi Nyôbô Somewake Tazuna". March 1903: Kitsusaburô played at the Bentenza the role of Iwafuji in the drama "Kagamiyama"; his stage partners were Jitsukawa Enzaburô IV (Onoe) and Onoe Taminosuke (Ohatsu). July 1903: Kitsusaburô played at the Bentenza the role of Gappô in the drama "Sesshû Gappô-ga-Tsuji"; his stage partners were Arashi Tokusaburô V (Tamate Gozen) and Kataoka Gadô IV (Shuntokumaru). November 1906: Kitsusaburô played at the Bentenza the roles of Yazaemon ("Sushiya") and Kawagoe Shigeyori in the classic "Yoshitsune Senbon Zakura". July 1911: Kitsusaburô played at the Asahiza (Ôsaka) the role of Tsuribune Sabu in the drama "Natsu Matsuri Naniwa Kagami"; his stage partners were Jitsukawa Enjirô I (Danshichi) and Nakamura Naritarô I (Issun Tokubê, Otatsu). 20 April 1915: Kitsusaburô died. Arashi Kitsusaburô IV was a popular kaneru yakusha, who spent all his career in Kamigata minor or major theaters, sharing the stage with the biggest stars. His popularity went down in his later years and he ended his career as a supporting actor in the troupe led by the star Nakamura Ganjirô I.